The new Micra is considerably better than the previous model. With a high-quality cabin, plenty of equipment and a decent drive, it's a good rival for the Ford Fiesta and VW Polo. While previous Micras have always been earnest, reliable runabouts, they have had all the panache of your granny’s tea pot. Thankfully, that’s all changed with this latest car. It looks great, smacks of quality inside and out, is well specified and is a decent thing to drive. If you’re in the market for one of the better all-round superminis, the Micra is certainly worth a look. For reasons best known to Nissan, it was decided that the current Micra would be a ‘world car’, which is effectively industry code for ‘let’s build the thing as cheaply as possible’. Of course, in a market as rich in supermini talent as the UK's, this approach generally leads to only one thing: sales plummet like an anvil falling off a cliff. Looking to re-establish the Micra as a credible player once again, this new, fifth-generation model is charged with reversing the 'cheap-and-not-so-cheerful' trend by ushering in edgy new styling, a wider and longer body that significantly improves interior space, and an exponential upgrade in cabin quality. With one eye on a positive score in Euro NCAP crash tests, a range of big-car safety features is part of the Micra’s DNA, with lane-departure prevention and autonomous braking with pedestrian detection fitted as standard, even on base models. 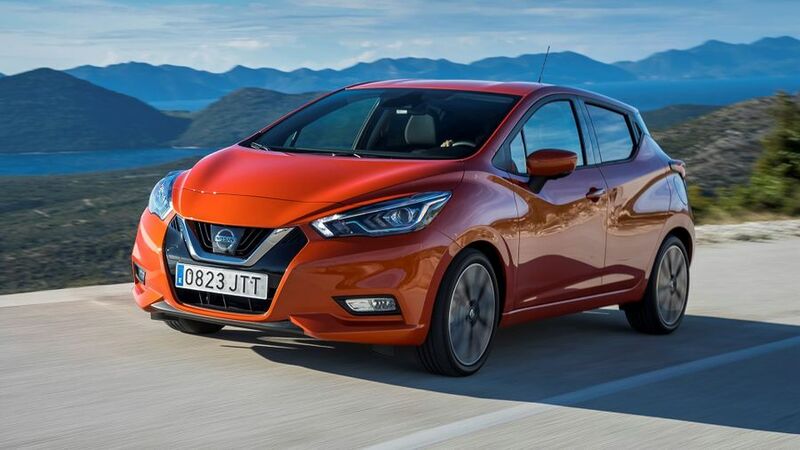 Nissan is also keen to push the personalisation theme with the new Micra, offering lots of colour combinations, as well as contrasting bumper inserts and stickers, both inside and out. You can even specify sports seats complete with Bose speakers built into the headrest, which enable you to mainline kicking tunes directly into your cerebellum. 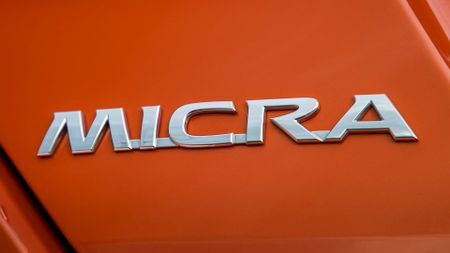 Along with the basic 1.0-litre 73bhp motor, additional more powerful, more efficient engines – including a 0.9-litre three-cylinder turbocharged petrol engine and a 1.5-litre diesel borrowed from alliance partners Renault – are also new to the latest Micra. Sexing up the line-up even further, it’s rumoured that a hot Nismo version of the Micra is in the pipeline, so that’s something for all you Ford Fiesta ST freaks to salivate over. For the time being, though, we’re concentrating on the 0.9 three-cylinder turbo petrol engine, as it’s likely to be the best seller. 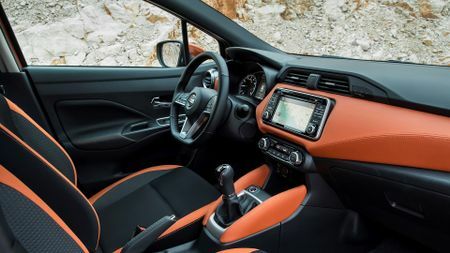 Stepping inside the new Micra, the first thing that strikes you is just how much more grown up it seems than its predecessor. Everywhere you look and touch, the quality is so much higher that you’d swear the two cars were totally unrelated. Ok, some might argue that it wouldn’t be hard to improve on the old car's quality; but, even so, it’s difficult not to be impressed by the Micra’s swish new dashboard, with its surprisingly convincing faux-leather, colour-coded panels, pleasingly weighted controls and neatly proportioned sports steering wheel. Whether you do a lot of miles or not, your driving position is pretty crucial, and here – as usual – it's something that Nissan does particularly well. The top-end seats are really supportive, and there’s plenty of two-way steering wheel adjustment. The steering wheel does feel subtly cranked inboard and the pedals are just a smidgen offset, but overall, it’s a very comfortable layout, and there’s loads of space to rest your left foot; much more than you get in a Ford Fiesta. Getting your youngsters in and out of the back is something you’ll need to supervise, though, as the hidden door handles – so beloved of designers, but not ergonomists – are sited far too high for small children to reach. 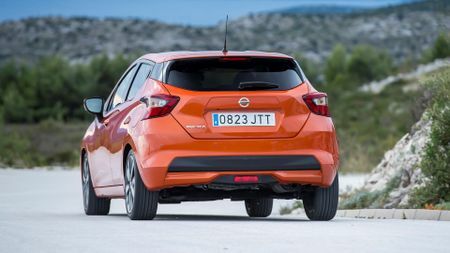 Once in the back, headroom is compromised to some degree by the Micra’s sloping roofline, and rear legroom – as with almost every other supermini – is on the snug side. That said, if you only use the rear seats to fling your shopping on, or to accommodate a child seat, things will be fine. At 300 litres, the boot is not exactly ginormous, but that’s still 10 litres more than you get in a Fiesta. Driving the Micra is a bit of a mixed bag. Initially, the engine feels very sluggish, but much of this is down to the immense amount of travel in the throttle pedal before the engine begins to pick up speed. Things aren’t that plain sailing once the revs are established, either, as the turbo tends to dish out an undisciplined surge of power, almost at will. Consequently, even when you just want to motor along at a leisurely cruise, you find yourself on and off the gas pedal like a church organist. 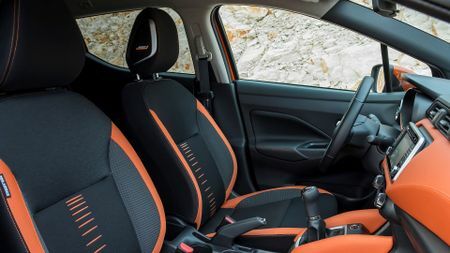 Thankfully, the clutch and gearshift work neatly, and although they lack the ultimate precision of those found in a Ford Fiesta, it’s a testament to Nissan’s engineers that they are so much better than the rather rubbery items found in the Renault Clio. Renault could also learn a lot from its Japanese partners when it comes to steering precision. 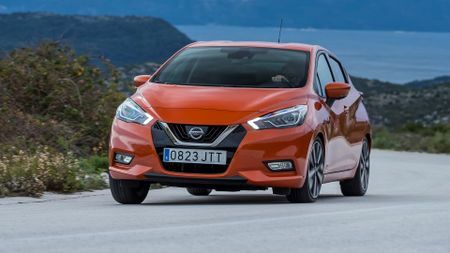 Once again, the Micra's mantra is 'light and easy does it', but there’s still a good deal of pleasure to be derived from the Nissan’s steering, which glides from side to side with a pleasingly fluid action. The suspension probably straddles the divide between a Fiesta and a Volkswagen Polo. It’s not quite as tied down as the Ford, but has a degree of body control that's missing from the VW when you start pushing on a bit. So, there’s a good chance this compromised position could prove to be just the ticket on our beat-up British roads. Obviously, we’ll need to drive the car in the UK to prove the point, and the same can probably be said about the Micra’s ability to isolate occupants from noise, vibration and harshness. However, we wouldn’t mind having a little bet right now that Nissan’s new baby will knock spots off both the VW and the Ford in these key areas. Certainly, while engine- and road noise seem extremely well isolated, the suspension is impressively quiet when encountering lumps and bumps. 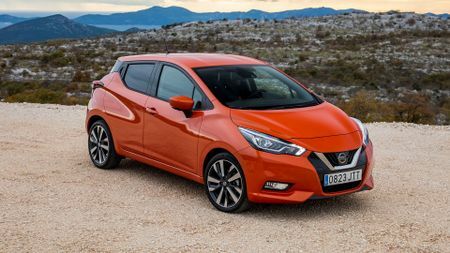 The Micra’s new-found desirability will probably be enough to ensure it sells well, and with Nissan’s excellent reputation for building reliable cars, it already looks like a sound investment. 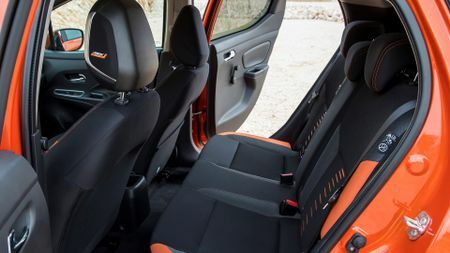 The fact that it has a spacious, high-quality and extremely attractive interior, allied to a decent driving experience, means it should definitely be on your shortlist if you’re in the market for an affordable, high-quality supermini. The Fiesta is a class-leading supermini, with fine handling, good looks and decent practicality. It is very hard to fault and it’s due to be replaced soon, so there will be some cracking deals available. The Fabia is a very capable supermini. It does everything well and has few flaws, but its real strength is its outstanding space and practicality. Definitely worth a look if you’re after a less obvious supermini. The Polo is one of the most appealing superminis, with a high-quality interior, a desirable image and a grown-up driving experience. It's available with a wide range of efficient engines and most models are pretty well equipped, too. Interested in buying a Nissan Micra?